Delivering world-class interdisciplinary research & innovation to improve the whole-system response & resilience of infrastructure, institutions & communities against extreme events and critical incidents, and contribute to the UN Sustainable Development Goals. The Centre for Disaster Management and Public Safety (CDMPS) was established in 2014 at the University of Melbourne. CDMPS strives to promote disaster management research at the University of Melbourne. It fosters interdisciplinary research collaborations, provides training and skills development for our community of researchers, and promotes knowledge exchange and impact with regional, national and international stakeholders. The Centre provides research facilities for disaster management researchers at Masters level and above. The building provides a workspace for higher degree researchers, doctoral and postdoctoral researchers, as well as visiting scholars and research groups. The Centre hosts a wide range of collaborative, training and engagement activities. We welcome questions about the Centre and suggestions for research and engagement activities. Please contact us at cdmps-info@unimelb.edu.au. The new global norm of extreme weather-related disasters and climate change requires a new type of disaster-resilience modelling. There are exciting opportunities for PhD research on the United Nations Sustainable Development Goals (SDGs) available with CDMPS and CSDILA for talented candidates. We are pleased to announce the success of the first international symposium and workshops, A Smart Sustainable Future for All – Enhancing Resilience in a Changing Landscape(SSF 2018), from 24 – 26 September 2018 at the University of Melbourne. We successfully launched A Blueprint for Disaster Management RD&D Supporting the Sustainable Development Goals at the international symposium A Smart Sustainable Future for All on 25 September 2018– the third anniversary of the United Nations Sustainable Development Goals. The United Nations – Global Geospatial Information Management (UN-GGIM) Academic Network Forum was held in the week from 1 – 3 August as part of the Eighth Session of the Committee of Experts on GGIM at UN Headquarters, New York. Would you survive a zombie outbreak?CDMPS was approached by Xbox to simulate how a zombie outbreak would spread across Australian and New Zealand cities. Director, Prof Abbas Rajabifard, delivered a plenary speech on the topic of 'Spatially Enabled Societies and Smart Communities' at the International Federation of Surveyors (FIG) Congress 2018 in Istanbul, Turkey. VicTrack management representatives led by Mr Julian Williams visited CDMPS to discuss the potential for future research collaboration with David Williams and Geoff Spring in March. Prof. Abbas Rajabifard, Director of CDMPS, will be a plenary speaker at the FIG Congress 2018 in Istanbul, Turkey. Congratulations to Dr Farzad Alamdara on receiving his Doctorate degree on Tuesday the 10th of April at the University of Melbourne. We congratulate Dr Saeed Asadi Bagloee on receiving his Doctorate degree on Monday the 11th of December at the University of Melbourne. The Dean of the Schulich School of Engineering at the University of Calgary, Prof. Bill Rosehart (2nd from left), visited the Department of Infrastructure Engineering and CDMPS on 01 December 2017. On Friday 24 November 2017, representatives from CDMPS met with Peter Clemons, the founder and Managing Director or Quixoticity. CDMPS supported and took part in the 2017 Comms Connect conference at the Melbourne Exhibition and Convention Centre, 21 – 23 November. In September 2017, CDMPS hosted a number of prominent guests from the University of Melbourne to showcase the Centre’s major research, training and engagement activities over the past 3 years, as well as our strategic plans for the future. Professor Abbas Rajabifard, Director of CDMPS, was invited to give a one day presentation by the Malaysian Board of Surveyors in Kuala Lumpur, Malaysia.Professor Rajabifard's talk was titled 'Spatially Enabled Platform to Support Liveability Planning for Smart Cities'. CDMPS hosted a humanitarian mapping event in collaboration with the Department of Infrastructure Engineering and Spatial@Melbourne. The OpenStreetMap (OSM) Points of Interest (POI) Analyser assists OSM users to determine the quality of POI locations. The goal of OpenStreetMap is to provide a free, accurate and opensource maps to users around the world. Congratulations Dr. Farhad Laylavi, our first PhD Graduate. Members from CDMPS and our close partner, the CSDILA, met with Denise McKenzie this week to showcase our capabilities and current projects in the area of 3D visualisation platforms. Our close partner, the Centre for Spatial Data Infrastructures and Land Administration, is hosting the 3D GeoInfo conference this year as a part of 3D Australia. Our close partner The Centre for Spatial Data Infrastructures and Land Administration, in collaboration with the Global Spatial Data Infrastructures Association (GSDI), Leuven University Belgium and the University of New Brunswick Canada, released a refereed book entitled ‘Spatial Enablement in a Smart World’. Congratulations Dr Nelson Lam for his promotion to Professor. The findings of ‘Beyond Bushfires’ were released on the 18th of November 2016; a six-year study of more than 1000 people impacted by Victoria’s Black Saturday bushfires. CDMPS will present a workshop at the upcoming 15th Global Spatial Data Infrastructure World Conference (GSDI 15) in Taipei, Taiwan. The workshop will discuss the design and development of a Global Disaster Management Platform, as well as discuss Smart Disaster Prevention. Centre for Spatial Data Infrastructures and Land Administration (CSDILA), successfully hosted the International Symposium on Smart Future Cities. Centre Director, Prof Abbas Rajabifard, and Centre Manager, Greg Ireton were appointed as members of the International Advisory Board of the China Association of Public Safety. CDMPS assists first RMIT Master of Disaster, Design and Development students with a visit to Marysville to meet experienced community members, businesses local government and practitioners. CDMPS co-chaired the first China-Australia Disaster Management International Symposium in Nanjing along with Hohai University (our hosts) and the Huaihe River Commission of the Ministry of Water Resources. We hosted an executive forum on communications from connected vehicles, sponsored by General Motors (GM). The 15th Global Spatial Data Infrastructure World Conference (GSDI 15) will be held in Taipei, Taiwan, Rep. of China, from 29 November to 2 December. 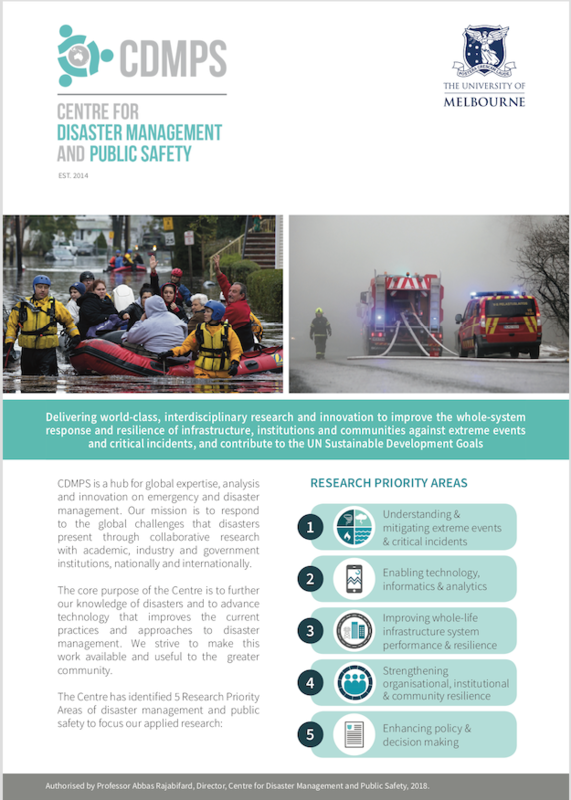 Research at CDMPS focuses on themes associated with preparing for, responding to, recovering from, and mitigating against incidents across the all-hazards spectrum of emergency/disaster management. This is an important objective in light of major disasters worldwide which have had a significant impact. In 2017, CDMPS reviewed its 6 research priority areas as part of developing a new strategic plan for the future. The research units were redefined and extended into the current 5 research priority areas. Each unit focuses on tackling particular challenges in disaster management and public safety and on developing innovative solutions to meet our Research Priority Areas and the UN Sustainable Development Goals. Research at CDMPS focuses on themes associated with preparing for, responding to, recovering from, and mitigating against incidents across the all-hazards spectrum of disaster management. CDMPS is dedicated to advancing research and knowledge in the area of disaster management and public safety. CDMPS engages with a wide range of national and international stakeholders and service providers from government and the private sector of disaster and emergency management. We work to engage with industry and communities to grow their understanding of disaster management practices and to improve public safety and community resilience to disasters. The Centre also engages through forums, symposia, workshops and public lectures to reach our broad audience. The Centre welcomes new opportunities to engage with stakeholders. If you would like to work with us, please contact us at cdmps-info@unimelb.edu.au. The Centre for Disaster Management and Public Safety provides a specialised training program to practitioners and postgraduate students wishing to work in emergency and disaster management. This includes specialised workshops, symposia and conferences for researchers and shorter training programs for government agencies, private sector bodies and other groups at the executive level. CDMPS welcomes interest into our training capabilities. 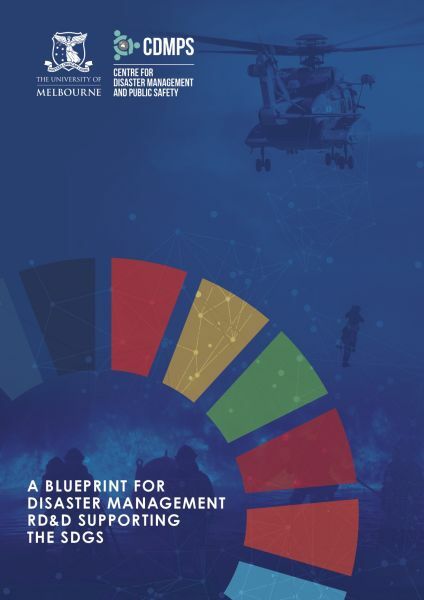 If you would like CDMPS to present a workshop or executive training in the area of disaster management and public safety, including the Centre's specific capabilities, please get in touch with us at cdmps-info@unimelb.edu.au.